A pair of Waffle House employees in Arkansas were fired for using the restaurant’s kitchen as a personal hair salon. Hmm, health violation? 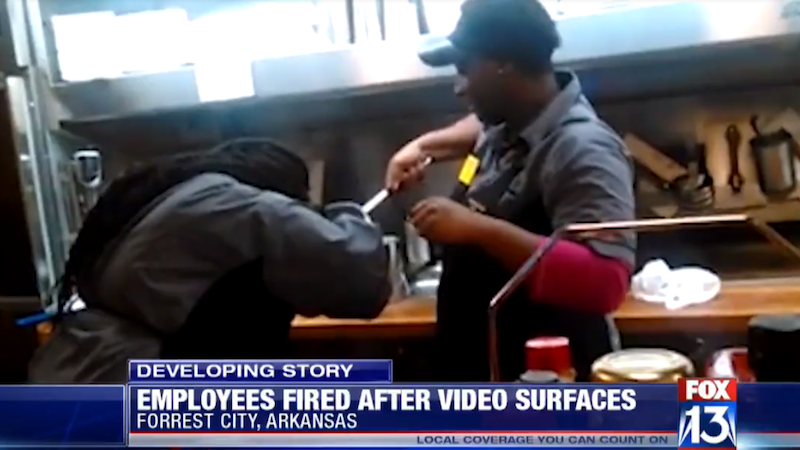 Video footage of the gross incident shows one employee placing her hair into a pot of water in the restaurant’s kitchen, with the help of a second person who seemed to not question whether this was a bad idea. A customer named Antonio Robinson says he and his friend were dining at the Waffle House last week when the friend coughed up a hair strand. Robinson then spotted the impromptu hair-washing session and captured it on his cell phone. “She dipped her hair down in the pot and when it came back up she was drying it off with one of the towels,” he told local station WREG. “I see people do that in their houses and things like that but for a restaurant, I don’t know.” Yeah, I don’t know. Video and news footage of the incident below.